Schemes 1-30 show the mechanical systems consisting of structures of the body and hitting it. The design can rotate around the axis passing through the fixed point O. It consists of homogeneous thin rods 1 and 2, or the homogeneous plate 3 and 4. Point cargo weight rods of 1 m length is 25 kg, the weight of 1 m2 of a plate - 50 kg weight point load - 20 kg. The dimensions of structural elements are indicated in meters. The body 5 (material point) mass T5 = 30 kg, moving with velocity v = 4 m / s, hits the fixed structure at the point A, and the blow is absolutely inelastic. Determine the angular velocity of the structure after the impact and perceived impact its momentum. Find also lost on impact kinetic energy of the system. 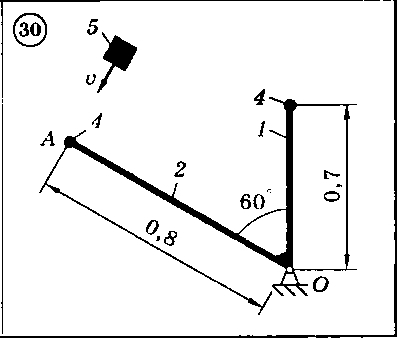 Right after the payment you will receive a link to the archive with the solution of the problem in theoretical mechanics D8 B1 (Figure 1) from the collection of "theoretical mechanics´ jobs Dievskaya VA Malyshev IA 2009 for university students.